Cancelled flights stink. Here’s how to get on the next flight ASAP (even if there’s no availability). I recently emerged from an ordeal caused by the mega storm Goliath. Only an inch of snow fell in Boston (my departure city), but other areas suffered deadly blizzard and flooding conditions which cancelled thousands of flights around the US, royally screwing things up for everyone. If you haven’t guessed by now, our flight was cancelled. Making things worse, the “perfect storm” of the holiday rush and bad weather put our replacement flight 3 whole days later. Determined to get home, we put all of our effort into getting back ASAP. Thanks to some good fortune and the kindness of strangers, we made it home the next day… not bad considering we shaved a full 2 days from the assigned delay. On this trip, we heard the phrase “the flight is completely booked and oversold” more times than I could count. After 2 unsuccessful standby attempts, we almost called it quits… But thankfully I said, “let’s just wait for 15 more minutes, because you never know what’s going to happen” and then the incident above happened 2 minutes before boarding closed. Arrive early, because most other people don’t. The sooner you can talk to a gate agent, the better your chances are. You can get on a Southwest standby list 2 hours before departure on a first-come, first-served basis. And if you’re at the top of the list, there’s a good chance that at least one person will miss their flight. We noticed many sprinting to the gate at the last minute. Still others don’t actively monitor their gates, leaving them blissfully unaware of changes or other people getting on the plane… a lesson one irate customer taught us when he missed his flight by 3 minutes (because he didn’t know to show up well before the departure time). If you’re punctual, other peoples’ tardiness can work to your advantage. Gate agents are people too. They have to deal with entitled, pissed off people all day. A simple smile or a token of sympathy can brighten their day and open a lot of doors for you, especially if you talk to the right person who has the power to make things happen (or slightly bend the rules). Everyone wants to have fun at work… right? And given the choice, you’d rather help a friendly face than a random rude person (where’s the self respect in that?). During our standby adventures, we found that gate agents have a good deal of latitude and don’t always have to stick to the rule book 100%. Make someone smile, and they might just go above and beyond for you. Be aware of all options and possibilities. Research online, on the phone, and get a second opinion in-person. Actively research all flights going to your destination (or even cities within a few hours driving distance). The more you know, the more specific and direct your questions can be when it matters. The conversations that ultimately got us home wouldn’t have happened if we didn’t actively make suggestions. We found that some airline agents with lots of experience know tricks that can help you find better flight options. Also, apps can be a lifesaver. When we landed in Houston and while waiting to deplane, the Southwest app helped us find a flight to our final destination in Austin leaving in 10 minutes. We were able run to the gate, request standby, and board in that limited time… all thanks to having information at our fingertips! 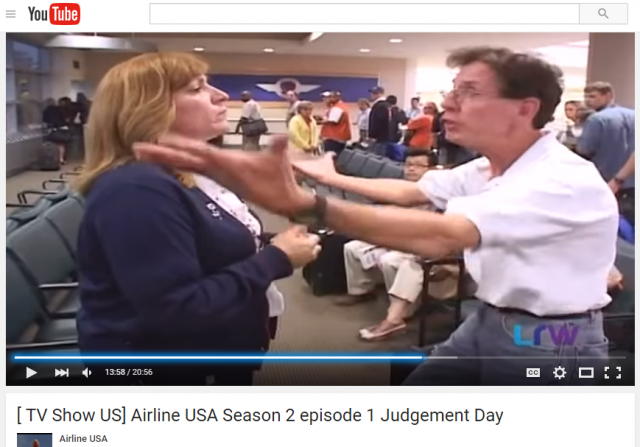 Remember the story about the disrespectful / racist travelers ? A mere 10 seconds after they were booted from the flight, our names were called from the standby list. We were hanging out right next to the check in counter when it all went down and leaped on the opportunity immediately. Had I not been there, many others would have gladly taken my spot. Thanksfully, we made sure airline employees knew we were there so they wouldn’t forget about us. On the flip side, don’t annoy the agents. They’re less likely to actively help you if you are a pest, and they certainly won’t want to go out of their way to bend the rules for you. Standing by is not for everyone, but if you absolutely need to be somewhere, sometimes it’s a must. You’re asking for a world of hurt if you expect everything to go perfectly or if you don’t have an open mind. Don’t be rigid. As Bruce Lee said, “be like water my friend”… that is, be able to adapt to whatever situation you’re presented with. Just go with the flow and follow the best path. One big mistake you can make is packing too much stuff. I recommend just taking what you can carry on. 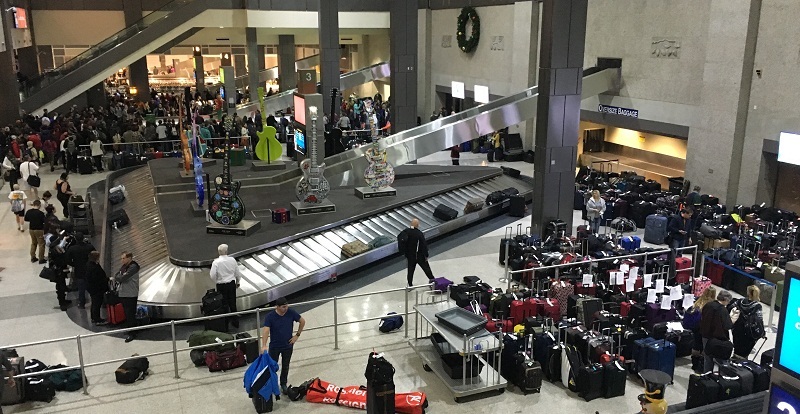 If you try to check bags, your luggage could end up in a totally different city than you or sit out unattended for hours or days… just look at all of the stranded luggage at the Austin airport in the picture above. Also, for treks between terminals you don’t want a giant pack weighing you down, especially if you have to sprint between gates like we did. Don’t limit your options, cost yourself more money, or kill your back with all of your junk. If you miss one standby, don’t lose heart. Instead, do something about it! For example, make sure to ask the ticket agent to roll you over to the standby list for another flight as soon as you miss one. And you should already know which one works best for you because you were proactive in doing your research … right? In general, just think 2 steps ahead and have a solid backup plan. For example, if one agent is busy, consider heading to another counter (the one at the departure gate of your preferred flight is usually a safe bet) before others do. Also, make sure to check every flight that might get you to your destination faster, including ones within driving distance of your final destination. The more possibilities you open, the higher your chances of success. That’s it! These tips will help you find travel joy even in the face of disaster. In summary, be assertive, be flexible, and create your own luck. Happy travels!